Fish are magnificent to behold in their natural environment. Denizens of quiet, they seem to be at peace, driven entirely by instinct, perhaps, or at the least given wholly to undistracted minds. Evidence suggests that fish may even be peace-giving. Science editor Sarah Knapton, writing in The Telegraph of London, cites a university study that demonstrated for the first time that staring at swimming fish really does lower blood pressure and reduce heart rate. Further, the study found that higher numbers of fish helped to hold people’s attention longer and improve their moods. It’s little wonder, then, that aquariums are often found in high-stress settings like dentists’ and doctors’ waiting rooms. Of course, many householders stock aquariums purely for the joy of observing creatures in an environment that we can only briefly visit. They may or may not be aware of their hobby’s beneficial side effects as they go about de-chlorinating the water in everything from goldfish bowls to massive tanks that encompass entire walls. For most people, stocking the aquarium, big or little, involves a trip to a pet supermarket or a big box store. Only a minority of those aquarium fish mongers, however, sell saltwater fish and most may offer few freshwater fish that go beyond the usual suspects: tetras, zebra danios, gouramis and for those who must have something larger, oscars. The more adventuresome may choose to dive in and capture their own fish for their tanks. The Emerald Coast is home to myriad species of fish, both saltwater and fresh. There are things you need to know, however, if your DIY project is going to be a sustainable success — as well as one that’s fully legal. 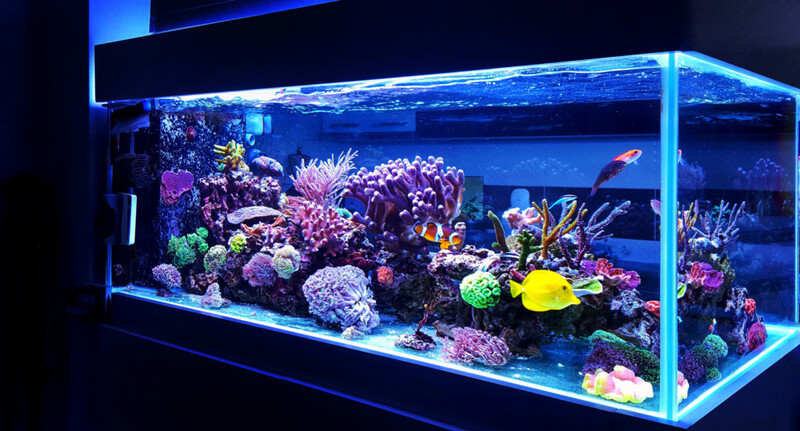 Saltwater tanks require careful monitoring and maintenance and more expensive water filtration systems. There is no need to monitor salinity levels in freshwater tanks and keeping tabs on pH levels is required only with regard to a few especially delicate freshwater species. Color is hard to come by among freshwater fishes — African cichlids are an exception to the rule — so, if you’re going for the wow factor, saltwater tanks are the way to go. “Saltwater tanks yield more vibrant, colorful fish than fresh water, and they produce more immediate gratification than freshwater tanks, which take much more time to fully cultivate an interest in,” said Joe Rogers, a sales associate at Panama City Beach’s Suncoast Pets. So, piscatorial relations are a factor, and it’s important, too, to consider how big your fish may grow when you are buying a tank. “Get the largest aquarium that you can afford and place where you want it because that determines which species can be accommodated, as well as how many,” Rogers advised. More than one tank will also be required, as a so-called quarantine tank will ease in transitioning fish to their permanent home as well as ensuring that purities and bacteria are filtered out and prevented from causing complications. The hobbyist who is inclined to harvest his own fish for display should be mindful of regulations that pertain to that activity. From curmudgeonly catfish to adorable angelfish, get tanked up. There’s a world of wonder waiting for you to discover just behind the glass.